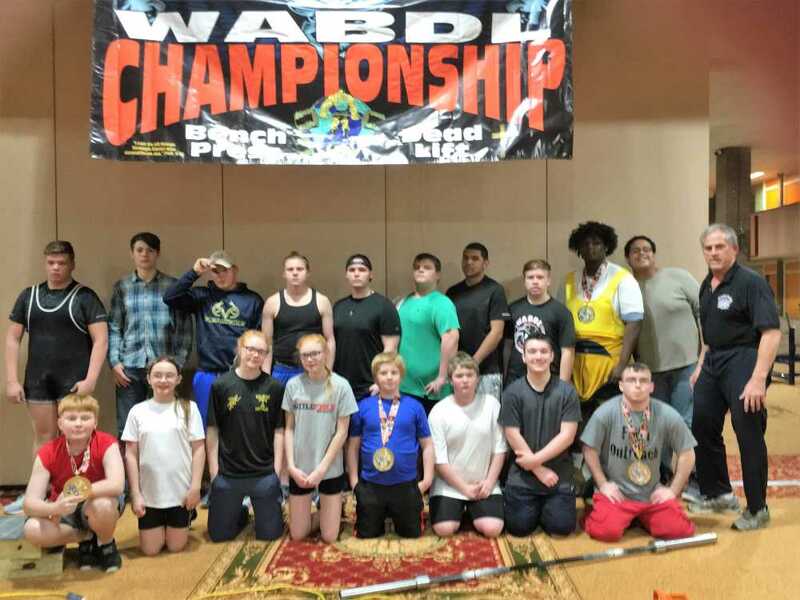 Nineteen Trumann athletes competed and the fifteen teenage athletes combined to win the teen team World Association Benchers Dead Lifters national championship recently at a meet held in Jonesboro. The athletes are coached by Eddie Morgan. Competing in the 10-11 year old, 105 pound (10-11, 105) women’s division, Harley Garrett won first place in bench press (BP) with a 45 pound lift and first place in the dead lift (DL) with a 125 pound lift. In the men’s 10-11, 105 division, Noah Barnes took first with a 55 pound BP and 135 pound DL. In the 10-11, 132 division, Joseph Barnes also took home to first place finishes with a 65 pound BP and a 155 pound DL. In the women’s 12-13, 105 division, Sonia Barnes claimed two wins with a 75 pound BP and a 215 pound DL while twin sister Tonia Barnes won both events with a 105 BP and a 250 pound DL. In the men’s 12-13, 181 division, Andrew Carter had a winning 125 pound BP and a winning 303 pound DL as Ashton Creecy won both his events in the 12-13, 198 division with a 145 pound BP and a 330 pound DL. In the men’s 14-15, 132 division, Dakota Jones placed second in DL with a 132 pound lift. In the 14-15, 198 division, Hunter Chaffin had two wins with a 205 BP and a 415 DL. In the 14-15 men’s, 308 division, Jacobee Knave, Jr won the BP with a 183 pound lift and the DL with a 385 pound lift. Also in that division, Jereme Arnold took second in the DL with a 380 pound lift. In the men’s 16-17, 165 pound division, Ozzy Barnes won the BP with a 187 pound lift and placed second in the DL with a 370 pound lift as Juan Hernandez took second in the BP with a 183 pound lift and first in the DL with a 375 pound lift. In the 16-17, 181 division, Cade O’Brien placed second with a 125 BP and first in the DL with a 281 pound lift. In the 16-17, 209 division, Cody Blanchard took first in BP with a 160 pound lift and first in the DL with a 430 pound lift. In the 16-17, 220 division, David Taber won both events with a 318 BP and a 418 DL. In the 16-17, 259 division, Desean Mason placed first with a 385 pound DL. In the 16-17, Super division, Marques Dodson took first in the DL with a 380 pound lift. Danny Webb competed in the 20-25, 165 division and placed second in the BP with a 145 pound lift.